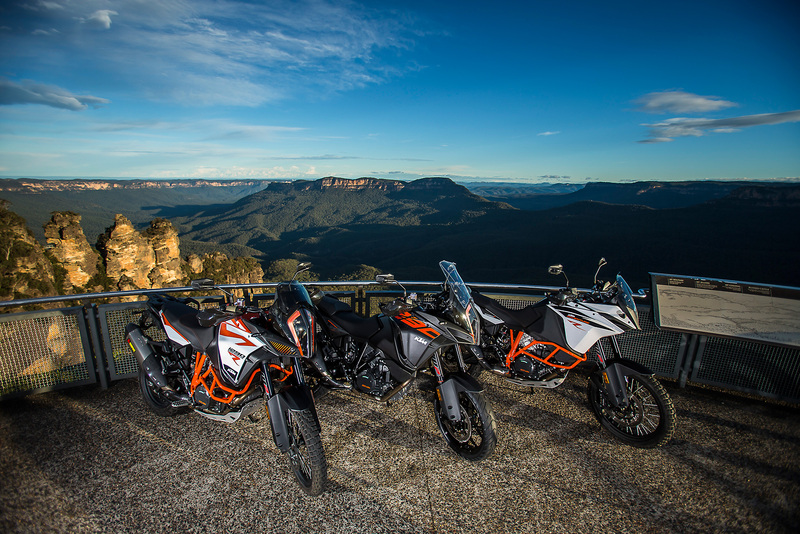 Having owned the first fuel injected KTM 990 Adventure and ridden thousands of kilometres on newer ones, I expected big things from the latest 2017 Adventure range. 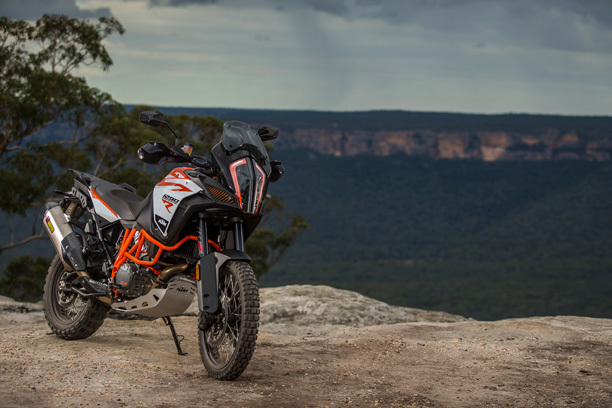 Was I disappointed by KTM’s 2017 Super Adventure machines? No, but at the same time I wasn’t amazed by the new models either. I guess when they have been so good for so long, it was going to be hard to build something outrageously better. What has improved over the years is smoother fuelling, less vibration, and more reliability from the engine. It’s still heavily based on the LC8 engine platform but it certainly feels like the 2017 engine package is more refined than ever. The electronics have stepped it up a notch too. For me, the 2017 electronics are the best I’ve sampled on a KTM. Not perfect, nothing ever is, but it’s very close to what buyers want. Nothing overly complicated to use and real world settings. Besides that, each of the bikes ridden at the launch are as tough as teak, can handle being bashed around, and have the things KTMs are renowned for, like power and presence. 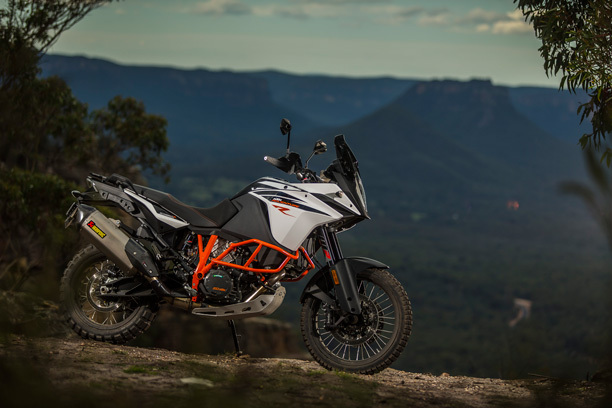 This is the KTM for an around Australia trip, solo or two up. Want to sample some dirt roads along the way, even some tricky stuff? No dramas, it’s a great all round machine. 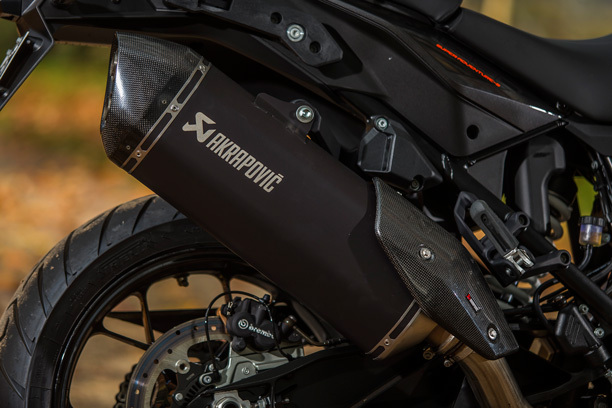 With an engine based on the 1301cc Super Duke R donk, it’s no slouch power-wise. It’s been tamed somewhat compared to the Super Duke R, losing some 30 plus clydesdales along the way, but with 160 of them available you will be entertained. Torque is strong too, 140 Nm of it, with nearly 110 at 2500 RPM. You can play with the gearbox if you want, but you can be lazy too. I did expect power to come in a little stronger at low revs, with a real kick in the pants from around 5000 rpm. Did I expect too much? Probably. After riding a 1290 Super Duke R ‘around the block’ more than a few times that’s what I was expecting from the Super Adventure S.
Here’s a few interesting points of the 2017 engine. Its pistons are 3mm larger in diameter than the previous model 1190 Adventure but they’re lighter, have shorter skirts, and are Grafal coated for less friction and more durability. Compared to the 1190, the crankshaft is lighter and has a better web design, not exactly knife-edged or anything but it will carve through its arc with using less power. This adds up to better throttle response. We all love better throttle response. Big twins like nothing better than locking up their rear wheel when the rider gets a little happy changing down the gears, especially on dirt. That’s where the good old slipper clutch comes to the fore. 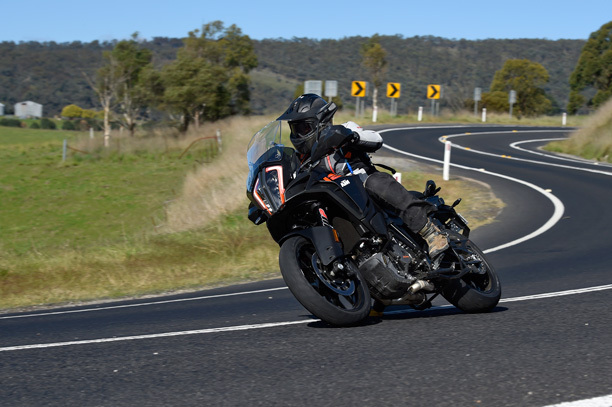 The one fitted to the 1290 Super Adventure S is superb (it’s the same in each of the Adventure models), and besides releasing the clutch plates slightly when you’ve gone down one gear too many, it works the opposite way, providing ‘grip’ under hard acceleration by forcing the plates together for better drive. This allows for the use of lighter clutch springs. 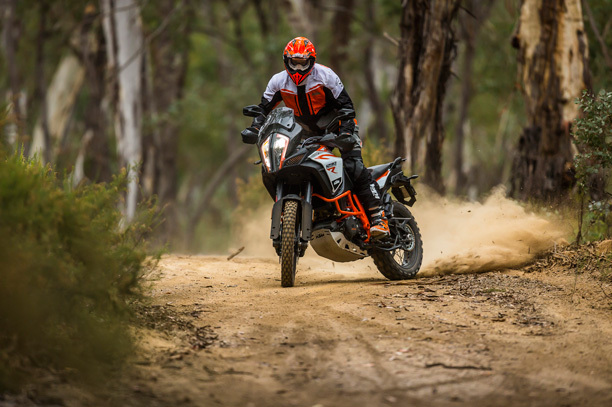 No longer will you see KTM Adventure riders with Popeye-esque left arms. All bikes I rode on the launch had the optional quickshifter which works up and down. Cruising or charging, the quickshifter was hard to fault. Styling is a funny thing with adventure bikes. If it’s a café racer it has to look ‘right’. An adventure bike can look as ugly as sin as long as it’s good at its job. I’m not saying the Super Adventure is an ugly step-sister but it’s no glamour either. The biggest styling change is the LED headlight set-up. They have a funky look to them, and on closer inspection you can see there are two separate sides to the light set up, with an air gap between them directing air to the alloy bracket holding the lights to the bike. LEDs can generate quite a bit of heat and the alloy bracket also acts as a heat sink. We all need to know exactly where we are going when cranked over, knee on the deck, throttle pinned to the stop (maybe at the Isle of Man Picko… Ed. ), and that’s why there are cornering lights on the Super Adventures. They even work at reduced angles of lean, like I achieved on the launch. The bottom three LED lights on either side of the twin beams are the cornering lights. Great in tighter turns but I’m assuming when you are cranked over at high speed in the dark, you won’t be looking where these cornering beams are pointed. Nice touch though. There’s loads of electronic trickery on this bike too. What stood out for me was the active suspension which works sublimely. It’s when you ride a bike without it back to back you realise how good it really is. Top points KTM. I also liked the idea of cornering ABS – although I wasn’t brave enough to really test it out. There’s lean angle sensitive traction control and tyre pressure monitors too which are practical safety features. KTM has a good handle on what riders want and has tweaked the riding modes to suit. There’s not too many of them, and the traction control settings interact with the riding modes. KTM’s got this pretty-well nailed. An optional Travel Pack is available, which includes numerous technical add ons, including Motor Slip Regulation, which works opposite to the Traction Control. Where you slam it down the gears enough for a compression lock-up, the ride by wire system opens the throttle slightly to prevent this, working as a pseudo slipper clutch you might say. But it has a slipper clutch so it’s a bit confusing. In practice it comes in handy under engine braking: if the rider releases the throttle abruptly on slippery asphalt, or if the clutch meshes too quickly. Hill Hold Control is another part of the Travel Pack, and it’s great for hill starts especially two up and loaded to the hilt. I wasn’t a lover of it to be honest, requiring more throttle than usually needed at take-off to overcome the HHC. I get the idea though, just didn’t like the feel of it. Smaller riders might disagree with me on this. You can also plug your phone into a neat little pouch, with a connection to charge your phone along the way. 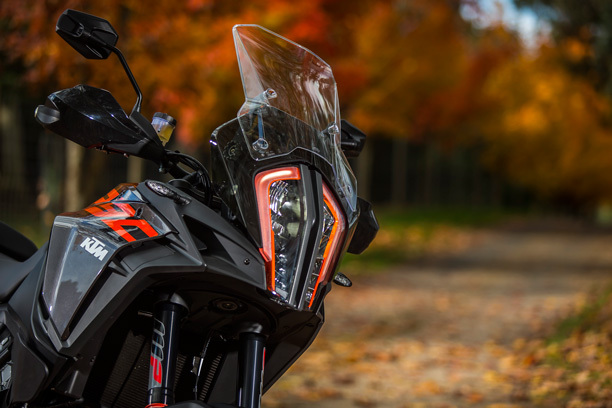 KTM’s ‘My Ride’ works with your phone to take calls and play music, and this is all controlled via the TFT display, so you can keep your hands on the ’bars while you’re doing it. 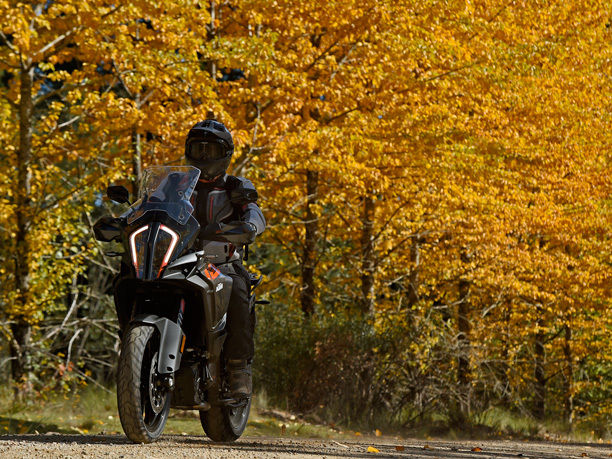 On the road the 1290 Super Adventure S is a delight. It’s extremely comfortable, as you would expect, and is fast. It’s made for Australian country roads, can traverse vast distances on rough roads fast and with ease. When you want to ride it hard, no dramas, it’s up for it too. Factory accessories abound for this bike, from touring panniers to Akrapovi? mufflers. Our test bikes had the Akrapovi? slip ons and sounded fantastic. I got on really well with this bike. I have history with big-bore Kato adventure bikes and this is easily the best I’ve ridden yet, when it comes to the more road-biased ones. How many people need 1290cc dirt bikes? Not me that’s for sure, it would just be a quicker trip the hospital. It’s easy to dismiss this bike as over the top but when you see great riders showing what it’s capable of off-road you realise how good it is. 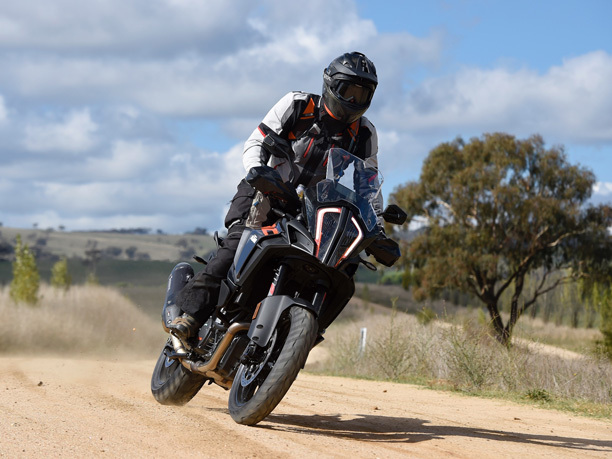 I see this bike as the perfect tool for outback touring, when the road from Bourke to Broken Hill has 200 kilometres of dirt then a bike like this is what you want to be on. It’s harder-edged than its S sibling. Gone are the cast alloy wheels, replaced with spoked rims and a larger diameter front wheel. The active suspension is also gone, with manually adjustable WP forks and shock. It has most of the electronic rider aids as the S but with some differences in riding modes, like the Off-road mode which allows more slippage on loose surfaces and less interference from the ABS. It also has a tyre pressure monitor, rare for bikes with spoked wheels, and this is displayed proud on the dash. Like the S you can tailor the TFT display to what is most important to you. Unfortunately time delays on the launch lessened our off-road time with the 1290 Super Adventure R. At one stage I found myself on a 1300cc motorcycle, in the bush, at night with tinted goggles. Not a good combination, but I survived long enough to see a well-known motorcycle journalist let the 1290 get away from him and end up like a crab on his back in the middle of a massive mud puddle. It was night, it was under 10 degrees, and it was as funny as f*$k. It was the closest I came to crashing the 1290 on the dirt. Once we got out of the bush and back on tar I worked out pretty quickly the 1290 Super Adventure R is a pretty good road bike as well. Of course the spoked wheels and more importantly the off road tyres restrict any road racing ideas you have but the engine, being the same as the S model is a gem. KTM has really sorted the fuelling issues some of the earlier bikes had. Now this bike is designed for hard-core off-roaders than either of the two 1290 models. Engine wise it has many of the updates as the 1290 engine, but being smaller in capacity it likes to rev more. It has less power, 125 horses to be precise, and of course torque is down compared to the bigger engine. That’s fine, it’s not designed for sustained high speed. For suspension it’s WP all the way, and the forks and shock are not dissimilar to what’s on the big-bore enduro machines. There’s 220mm of travel from both the 48mm upside down forks and the PDS shock and they are both fully-adjustable. 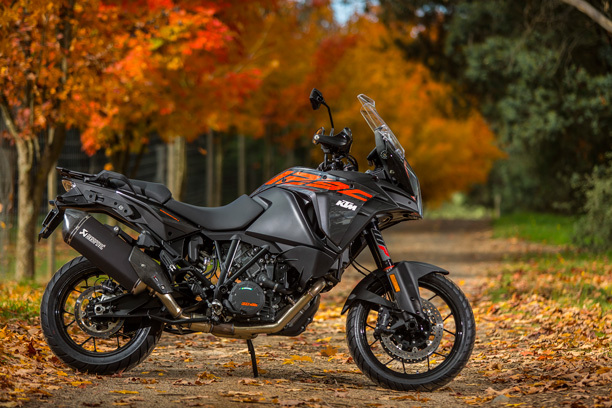 It has less electronics than the bigger-capacity models, and that suits this bike, but there is a multi-mode ABS set-up and riding modes, including Off-road mode. They all interact with each other and can be turned off if you’re more gung-ho than the next rider. Even though it’s more off-road oriented, it’s nearly as comfy as the 1290 models. It also has an adjustable screen, albeit smaller, and it has the older style dash, which is fine to use. I guess you could say it has less of everything, but in the case of this bike, less is more when it comes to serious off-road riding. 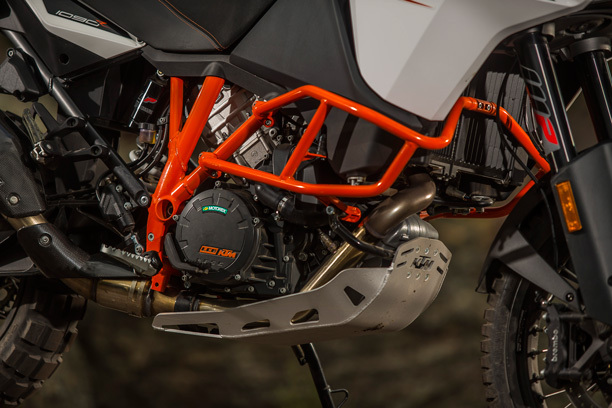 KTM Powerparts has a plethora of accessories for this model, turning it into a serious off-road adventure tourer. Bash-plates, hard panniers, touring screen, auxiliary lights and so on. 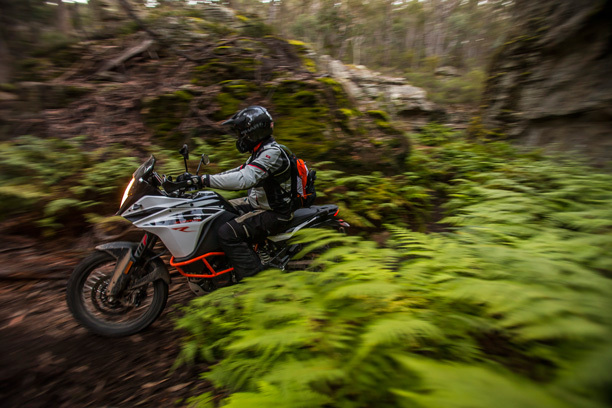 This is the KTM adventure bike you’ll take to the places you might be afraid taking the 1290 Super Adventure. On face value having three big-capacity adventure bikes from the one manufacturer is a bit of overkill but not in this case. In my mind KTM has designed each bike distinctly for different purposes. Yes there’s cross-over, and yes each bike could nearly go to the same places as each other if you are talented enough or were prepared to go through back tyres with gay abandon. I have no favourite out of the three because of these differences. It comes down to where you want to ride most dictating which bike out of the three you bought, not what each bike has to offer on the tech sheet. There’s lots more Cycle Torque content on Youtube, Instagram and Facebook, and it’s all free… but we could use your support. Cycle Torque ticked along on advertising for years, but in recent times the digital advertising revenues can’t hope to replace print income, so if you like Cycle Torque’s articles, videos and photos we’d appreciate it if you could contribute just $1 month so we can keep riding, writing, shooting and posting! Check out our page at Patreon.com or our support page. Indian Motorcycle’s 1 in 50 promotion.